During the holidays, every place of business will experience an increase in customers. This is because the holiday season is the busiest shopping time of the year and people tend to spend more money and frequent restaurants a lot more. This way they don’t have to deal with the stress of cooking after work or during holiday shopping. Because of the increased number of customers, it is important that your restaurant is completely ready to deal with the holiday rush, both in terms of supplies and staff. 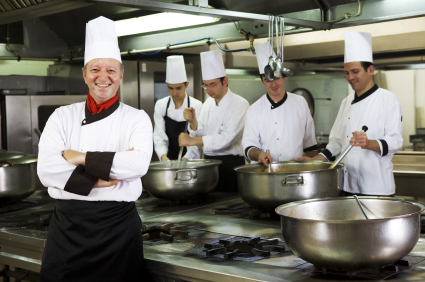 Here are some things you can do to help your kitchen staff get ready for this busy season. The first thing you can do to help your kitchen staff prepare is to hire more people to help out. If you were to rely only on the staff you currently have to take care of the holiday rush, you may quickly find that it will not work. Your current staff would have to work long hours, with few breaks, and invariably get worn out quickly. So you will need to hire new people for seasonal work, and be sure that they are willing to work during the holidays so you don’t have to force your regular staff to come in on Thanksgiving Day, Christmas Eve, Christmas Day or New Year’s. More staff will allow you to split up responsibilities, allowing your workers to spend more time with their families. Common sense got its name for a reason; and most people are aware of the things that it includes. However that doesn’t mean that everyone always follows his or her common sense. This is why you should go over some basic rules with your kitchen staff before the holiday rush comes. When the restaurant gets busy, your staff will get stressed and may forget to do use their sound and prudent judgment by forgetting simple things such as smiling at your guests. To help your staff reinforce their own common sense, you can ask them to point out a positive thing about each guest they are serving, such as complimenting a child on his or her outfit or toy. Let your staff use their own shining personality to reflect his or her common sense and let them reflect that in your restaurant. If you want your restaurant to run smoothly during the holiday rush, it is important that you and your staff work together as a team. Try to get them in this mindset early on and you will see great results. A great way to ensure that you all work together is to have a quick team meeting at the start and end of each day. During this time, go over any goals or special tips that you want your staff to follow. You can also use this time as a mini “pep rally” to make sure that your team stays motivated throughout the day. The holidays can be incredibly stressful; your restaurant will have a lot more business than usual and that means that you and your staff will start to get stressed. Usually when you get overwhelmed, you are more likely to make mistakes and forget simple things. That is why a great way to prepare your staff for the holiday rush is to have an organizational plan in place. For example, have a closing checklist placed at each of the stations in the restaurant. This will ensure that even though you were exceptionally busy the daily tasks still got done and nothing was overlooked. Don’t just put checklists out for your staff, you should also create one for yourself and put it in your office. When your restaurant is at its busiest, it can be hard for your staff to stay positive. That is why it is so important to always compliment your staff on a job well done. If they seem to be having a bad day, point out what they did right (while giving constructive criticism for any mistakes). If you really want to keep your staff positive, consider giving some sort of holiday bonus. If they know it is coming, it will give them something to look forward to and keep them motivated. Remember, the trick to getting through the holiday rush is to stay organized, positive and work together as a team.